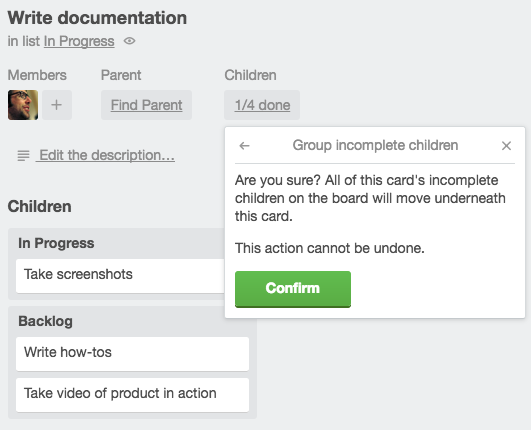 How can I group child cards under their parent? Sometimes priorities change on a project—it happens! When they do, it can be laborious to shift all of your cards around manually to represent the new state of the project. Let Hello Epics cut down on the clicks and time you have to dedicate to this task by allowing you to shift a whole family of cards at once! 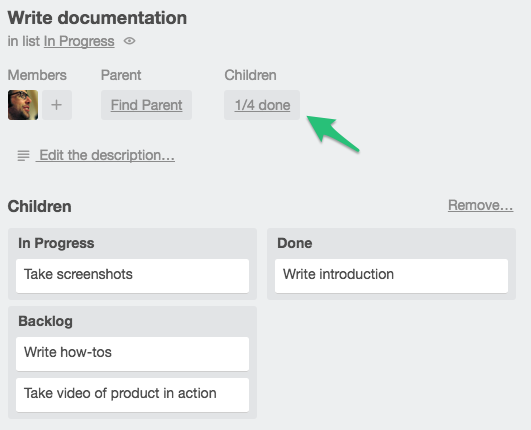 If you've grouped stories in your project as child cards under epics as parent cards, reprioritizing can be as simple as reorganizing the parent cards and using the "Group incomplete children" functionality in Hello Epics to shift the children to sit under their parents. 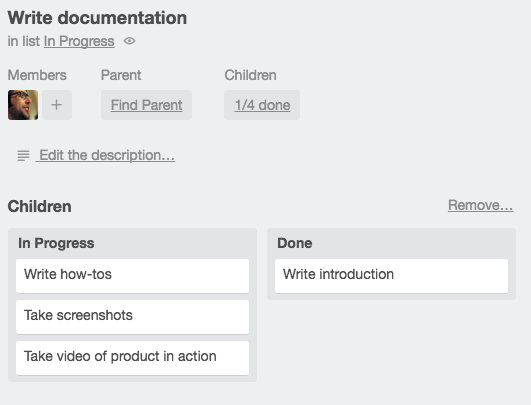 Let's take a look at this process with a single parent card. If we click on the "Write documentation" card, we'll get its card back. Under the children label at the top of the card, we see a link showing the number of complete children belonging to this parent. 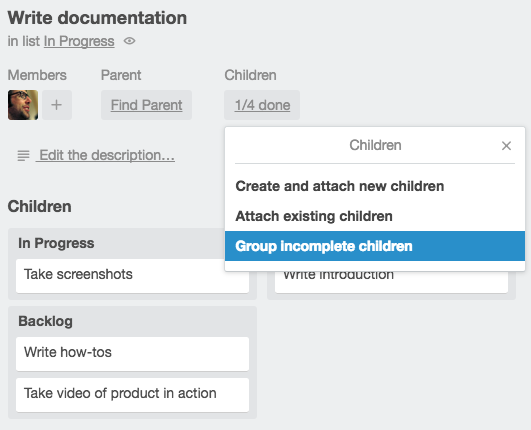 Clicking this link, gives us a dropdown that allows us to add children in a couple of different ways, but there's also an option to "Group incomplete children", which is what we're interested in. Do note the word "incomplete" there—children that have been completed will remain unmoved by this operation. Selecting the grouping option gives us a new dialog, where we can confirm that we want to move the children to sit under their parent i.e. the current card. When you confirm, you'll see the new positions of the cards reflected in the Children section of the card back. Exiting the card back, we now see all of the incomplete children under the parent, and the complete child remains in the done column. Now give it a shot on your own board to quickly and easily reorganize!